FORT COLLINS, Colorado – Proposals that could affect horseback riding trail use for 19 natural areas along the Poudre River will be unveiled November 9, 4- 7 p.m. at the Northside Aztlan Center, 112 East Willow Street. A virtual open house is also planned after Nov. 9 via a PowerPoint slide show with the same information as the live open house, and featuring a feedback survey, according to Zoe Whyman (ZWHYMAN@fcgov.com), natural areas community relations manager. Once public input from surveys and open houses has been considered, a final management plan will be drafted. The final plan for the natural areas along the Poudre River will be presented at a second and final open house. The new management plan could be adopted by the Natural Resources Director in early 2011. Visit www.fcgov.com/naturalareas for a map of the natural areas, and after November 9, a link to the virtual open house. LOVELAND, Colorado – Colorado Horse Rescue (CHR), a non-profit organization dedicated to helping horses in trouble, won a $1,000 grant in Group Publishing’s Community Service Awards today at Group’s annual grant-giving banquet. CHR, based in Loveland, is “dedicated to providing emergency relief, shelter, care, rehabilitation, and adoption services for abused, neglected, abandoned and unwanted horses.” CHR won the award for “Services Related to Ecology or Environmental Stewardship”. Last year, a nearby Loveland horse organization, Hearts and Horses, won the overall $25,000 Group Publishing award for its “Changing Leads” equine-assisted learning program. Group is an interdenominational Christian publishing company. More than 150 organizations competed for 29 grants in this year's awards. The banquet took place at the new Embassy Suites hotel at Larimer County's fairgrounds complex, "The Ranch". Hearts and Horses is hosting a haunted house through Halloween. Colorado Horse Rescue is hosting an open house Saturday, Nov. 6. The thing about Ted the Mule is that it tastes clean. A lot of wines leave a cloying aftertaste, but not Ted. Speaking of unexpected names, who would name their wine Ted the Mule? Obviously somebody pretty gutsy, with a devil-may-care attitude, and a sense of humor. That is exactly what you get out of Ted the Mule Red. Gutsy. Devil-may-care. Clean. Deep garnet color. Ted the Mule tasted great as we sat back on the old truck’s tailgate at sunset and proudly surveyed our renovated riverside-pen fences, gates, and hot-wiring. No, Ted the Mule, isn’t a horse, although by definition, mules are half horse, but we let him join the horsey wine collection anyway. What he lacks in genetics, he makes up for in strength of character. (Note: According to Tony Aspler aka: The Wine Guy, Ted the Mule “is a play on tête de mule, the French expression for stubbornness”.) Enjoy! "Loss of trails and riding areas" ranks third on the list of top issues among U.S. horsemen, according to a study by American Horse Publications (AHP). We wrote about horse trail use yesterday in our story about Fort Collins, Colorado eyeing use of its trails -- for horseback riding and other purposes -- along the Poudre River. The city is conducting a survey on future use, possible closings, strengths, and areas for improvement. By the way -- Issue #2 on horsemen's list? The cost of horsekeeping. Issue #1: Unwanted horses and what to do with them. Anybody in the horse business would do well to check out AHP's survey. 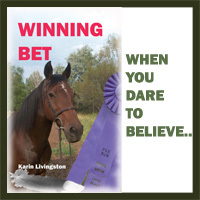 It is full of nuggets that will help the horse industry meet the future. FORT COLLINS, Colorado -- The other day, a city ranger truck pulled up along our property, which borders the Poudre River bike trail. The rangers, usually on bicycles, routinely patrol the river. We got to chatting, and it turns out the city is taking another look at how it uses its trails and natural areas. looking for feedback as it updates its 10-year plan for the Poudre River trails and natural areas between Overland Trail Road and Harmony Road. Horseback riding is currently allowed on many trails within the system, but it competes with biking, walking, jogging, swimming, rafting, kayaking, and wildlife protection. Horse Properties: Where do you fall in new county land use rules?